http://twopcharts.com I have been investigating my twitter history and came up with some interesting memories. My first tweet was sent on 25 Oct 2008. Therefore I have been using twitter for 1,136 days. The first account I followed was @nzcurriculum. I do not remember why I chose them first. The first account to follow me back was @CherylDoig and it was through her that I began to build up my followers. So far I have not quite broken sending 1000 tweets but I know I have read more than that as I regularly pop on to follow the breadcrumbs of other educators. 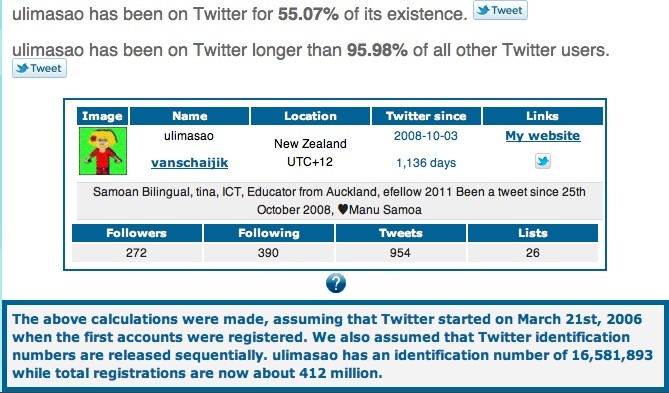 When I first began using twitter just over 3 years ago, I was number 16,581893 user. My stats say that I have been on Twitter for 55.07% of its existence. I began by following television stars like @Oprah and also a few preachers as I was interested in how they used this medium to communicate with their followers. I used to follow a few singers. I won’t name them here but you know who I mean. I soon became irritated by the hogging of communication. So now I dump twitters who hog the timeline. Every so often I have a clean out and find out who is not using twitter regularly and they get filed. Sometimes I check out who is following me and usually look for ‘julia’ type profiles that do not fit my educator profile. I do not know who introduced me to twitter, but I think it was at the time of @BarackObama and his presidential campaign. So it might have been the hype around his use. I witnessed his campaign using twitter and from then on I was hooked. Barack introduced me to the concept of real time technology as I watched the twitter timeline and the live video streaming of his win. For the first year using twitter was a lonely existence on the ground and yet really exciting up in the twitter cloud. I did not find discussing my use easy, as other educators around me were not ready for this social medium. But what I now find is that I have made some great connection. One of these was hooking up with the efellows. The list of 2011 efellows twitters can be viewed here on https://twitter.com/#!/dragonsinger57/core-efellows-2011. Great excitement happened when our principal took her initial twitter steps @newmarketschool. The URL had been booked for over a year and then last year she began to follow and then start post and respond to posts. However the greatest enjoyment I have had this year was when three of our teachers began to use twitter. @oprubyslippers, @MissNWalden and @Kyliegeddes. At this stage I use twitter to amplify some of the exciting learning that happens at Newmarket School. I do this by retweeting and adding users who I know will retweet the message. Every so often I might use it for advertising or to share a link. But it is the following of breadcrumbs that I enjoy the most. 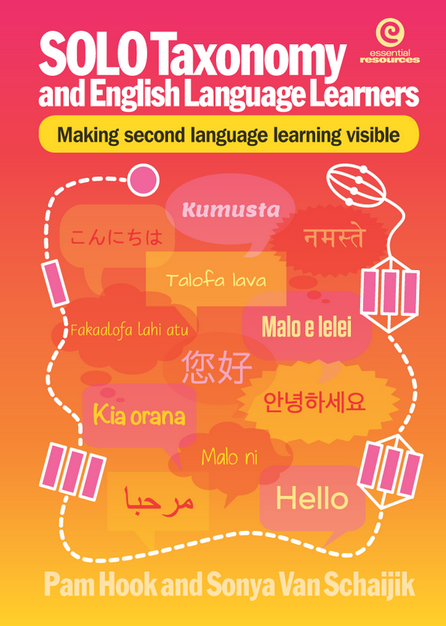 I have learnt so much using twitter and my wikispace http://www.ulimasao.wikispaces.com is the evidence of what I learn. Where to next, I really need to sort out my list and I will use @justadandak idea of sorting his followers into lists. I already have one list of Pacific Islanders on twitter and I set that up in the early days. What I find is that some of my favourite tweetchers are being buried in the online noise. I hardly see @arti_choke anymore unless I really go searching for her. I am getting better at using @ and # to amplify my tweets. I use my tweets for microblogging and when I am ready, I write a blog entry. So share with me your twitter history so that I may make links with my own learning about my twitter history.